It may come as a surprise to some golfers that the Rules do not require them to notify their marker or fellow competitor, which ball they are playing before starting a hole, nor when they are substituting a ball under the Rules during play of the hole. All that is required by the Rules is that a player can positively identify their ball in play, a subject which I previously blogged about in this article. Of course, I am not suggesting that a player should not inform those that they are playing with of the brand, number and any identifying marks on their ball; it is both good etiquette and the sensible thing to do, as it avoids any possible doubt that might arise when a ball is played out of sight. In fact, I recommend that markers make it a practice to ask the player they are marking for to describe the ball they are playing; how else can they be sure that the ball that the player finishes the hole with is the same one that they started with, or with the one that they correctly substituted under the Rules during play of the hole? Whilst on this subject I will make the point that in the absence of a ‘One Ball’ Condition of Competition, the player is permitted to change the brand, condition and colour of any balls they use during a round, without restriction. They may also borrow balls from any source. This makes it all the more necessary that they inform the other players in their group each time they change the ball they are putting into play. 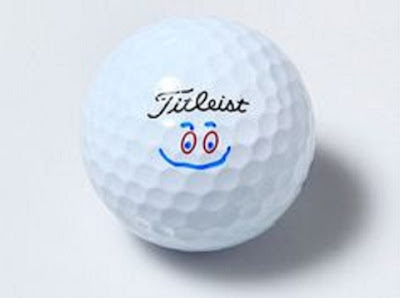 I have often wondered how many Titleist Pro V1, No.1, balls there are on an 18-hole golf course at any one time. My uneducated guess is that the average is probably in excess of 18, or 1 per hole, including those that have been lost. So, how can a player positively identify their Pro V1, No.1, from the others on the course, if there is no identification mark? Even this may not be sufficient. I tell the story of a retired senior who played his home course 3-4 times a week. He had a mental block on one particular hole, which led him to regularly slice his drive into the same area of deep rough to the right of the fairway. On one occasion, after a couple of minutes, he shouted to his fellow searchers that he had found his Titleist No.1 ball. “How do you know it is yours?” responded his marker. “It has the same personal identification that I always use”, he responded. “You hit so many balls into this rough that it would need to have today’s date on it for you to be sure”, was the terse, unsympathetic reply! Part of Rule 12-2 states that each player should put an identification mark on his ball. My strong recommendation is that each player must put an identification mark on their balls if they want to avoid incurring unnecessary penalties for playing a wrong ball, or not being able to positively identify a ball that has been found. You can now purchase my book, '999 Updated Questions on the Rules of Golf" as a paperback at this Amazon link. Which Ball is in Play?